AMALGAMATED Instrument Co has further enhanced its range of large digit displays. The displays are now equipped with two setpoint relays as standard and some models, such as the LD-TM "universal" displays and the LD-WT 4-wire strain bridge models are now supplied with four relays. The relays are form A with a capacity of 5A at 240V ac (resistive load). All the relays are individually configurable with high and low setpoints, trip and reset times, hysteresis (deadband) settings and operating mode (normally open or normally closed). In addition, in some models, relays 1 and 2 can be configured for proportional/integral control operation. The PI operation can be set for pulse width modulation control mode or frequency modulation control mode. This allows for progressive and accurate control of equipment such as dosing pumps, heaters, etc. Also announced is a remote programmer module for the AIC large digits displays. 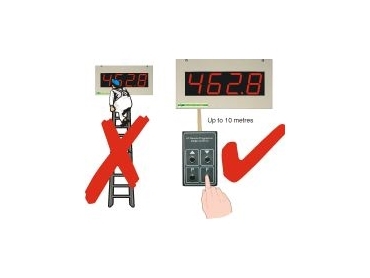 The remote unit is plugged into the display main board and setup and calibration can be carried out remotely. This is especially valuable in situations where the display is installed high in a location to provide good visibility. The operator is relieved of the necessity to climb up and down to make changes. Once plugged in, the remote programmer allows changes to be easily made. The unit is equipped with 10 metres of cable. AIC's large digit displays are available in digit sizes from 38mm to 200mm with some sizes available in both bright red LED or yellow "flip" electromagnetic display styles. The "flip" digit displays are ideal for exterior use. The LED models can be configured with an autobrightness feature to cater for changes in ambient light levels.